“Apply Dog Logic to Life: Eat Well, Be Loved, Get Petted, Sleep a Lot, Dream of a Leash-Free World” – Sark. This is the motto at Mutt Lynch Winery, founded in 1995 by Brenda and Chris Lynch in Sonoma. A chance meeting over 25 years ago along with a mutual passion for wine and all things dog has led this dynamic wine team to running a successful winery that caters to the dog lover. 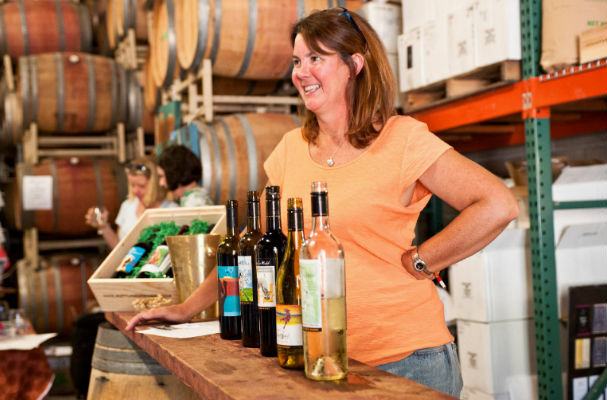 Brenda is the Winemaker and as she calls herself, the winery bee worker, while Chris is the marketing guru. Between the two of them and the rest of the Mutt Lynch staff, all women, they are carving out a nice piece of the pie as a winery to come back too. Lynch is proud of her work as a winemaker, which came naturally for her once she started playing around in the winery, but beams as she shares about the charities that Mutt Lynch has supported over the years. She is proud that they support local animal rescue organizations in their tireless efforts to save pets’ lives. Nationally, the winery supports North America’s largest pet adoption web service, Adopt-a-Pet.com, whose mission is simple – linking homeless pets with homes. 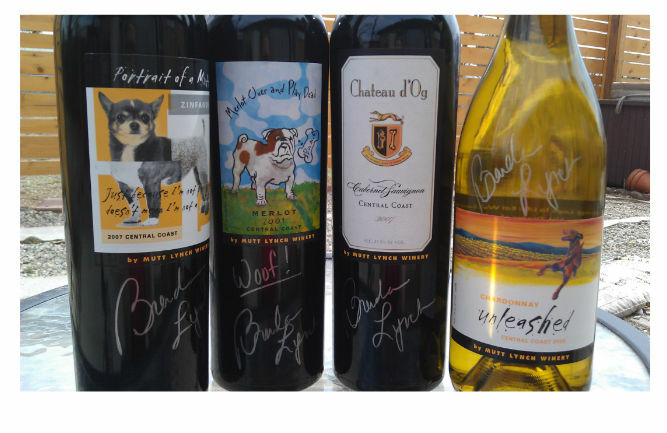 In communities throughout the country, Mutt Lynch partners with wine shops, restaurants and local animal rescue groups in support of their fundraising efforts. I was fortunate to meet Lynch at a local wine tasting event to raise money for an animal charity in my hometown and she graciously took time after a long day to meet me over dinner for an interview. Lynch has an energy about her that is contagious and a heart for what she does that makes you want to be a part of it. By the end of this interview I felt like I was sitting across the table from an old friend and eager to join her cause. 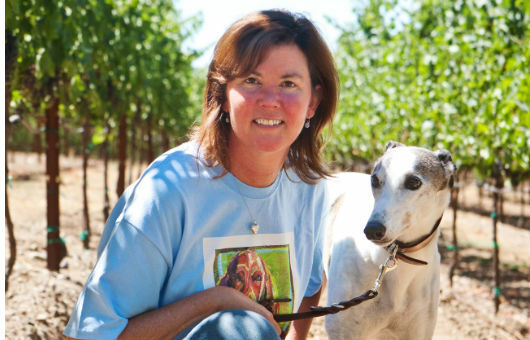 Without further ado, meet winemaker Brenda Lynch from California as she shares her passion for wine and pups. RS: What was your “A-Ha” moment when you knew wine was going to be your career? BRENDA: My husband and I had both been in the wine industry for quite a while and were both working for Gallo Winery. The moment for Mutt Lynch came when there was a fire at the humane society in the city we were living in. We had already made some wine, but we hadn’t come up with a name for our winery or wine. At the time Budweiser was offering the commercial with the lizards at the Super Bowl. They were having fun with their products; vodka was having fun, they were advertising flavors that had just started coming out, mixologists were just coming out, but the wine industry seemed to stay with the status quo instead of opening their doors and saying join us, we’re having a good time. That was very painful as a young female winemaker in an industry of men. We decided our first wine was going to be called Humane DeBone and had a little dog bone that hung by a string around the neck with the little wax seal around it. We gave back all the profits from that wine to our little local animal shelter. It was crazy, wildly successful; I mean we sold out like within minutes and my husband and I looked at each other and went, “This is our niche. This isn’t that crazy, stuffy world.” When I grew up there weren’t many rescue groups. I was that kid that came home with every cardboard box of whatever was in front of the grocery store. It was just a really good fit for who we were as human beings and so we looked at the pie, the industry, we realized we have a very small piece of that pie, but we really want to own it. We know who our people are in that little sliver and we market to them directly. We don’t worry about all the other stuff. No one ever walks up to me and says how many points did your wine get. They walk up and say how much wine or money are you donating. And that’s a completely different view in the industry and I like my niche and I like my little family that I’ve created in that niche. RS: What advice would you give to women interested in pursuing a career in the wine industry? BRENDA: First, don’t give up. Second, there are a ton of women out there and to search them out. Women open more doors for women in this industry. When I first entered into the industry, everyone assumes that the women know all the women, but when I first started there weren’t a lot of woman and I didn’t know all of them. So, this is a funny story, but I’ve got to share…When I was first going out to events for Mutt Lynch, like the one I did today, everyone kept asking me if I knew Zelma Long, she was a very big winemaker in the 90s. She started at Robert Mondavi and went on to having her own vineyards and I was like ”No, I’ve never worked for her, I just know her socially.” So, I met with Zelma and said, “Hey I need to work a harvest for you because everyone asks me if I know you and this would give me some credibility.” So, I worked 3 to 4 weeks for her during harvest and saw how her winery worked, and it was a great time. I thought, the next time I’m on the road for Mutt Lynch and someone asks me about Zelma, I’ll say “Yes, I worked a harvest with her.” Would you believe it, no one asked me about her. Instead, they asked if I knew Helen Pruitt, and I was like, are you kidding me. So, I was making wine at a winery that was next door to where Helen Pruitt was the consulting winemaker and every day that I would see her I would run down and say, “Hey Helen, can I just hang out with you because everyone’s asking if I know you and I want to tell them that I know you and understand how you make wine. She thought that was funny and we giggled and she let me hang out with her for a little bit. So, the next year I’m on the road for Mutt Lynch and I’m out there as a female winemaker and—this is the honest-to-God truth—the first tasting of the year, I’m in Birmingham, Alabama and a woman walks up to me and goes “Do you know Heidi Barrett?” I’m like that’s it…. I’m done…. I’m not worrying about who I know or don’t know. But with that said, you should look up Zelma as she’s truly the ice breaker for women in wine and a truly amazing wine maker. RS: As the winemaker, what is your favorite part of the process? BRENDA: Drinking it! In all honesty, it’s really neat when you’re done and you crack the bottle, whether it’s cork or screw cap, and you put it to glass and you are so proud. I feel like a mom, here’s my little baby and it’s complete and to me those are some of the most precious moments. I look at my girls, my wines; some of them are good, some of them misbehave and some of them I want to send off to boarding school. But, when you finally get it done and you sit down in a moment or like today’s event when you’re opening bottles and people are tasting them and a sparkle goes off in their eyes, when you know they get it—that is totally the best, most awesome moment. RS: Do you have a favorite wine that’s close to your heart? BRENDA: I absolutely love making Zinfandel. It was the first wine I ever made. Zinfandel can be very forgiving, so as a new, young winemaker I chose Zinfandel in case I got corrupt water. I’ve only had a couple tough water years, (I’ve been lucky, knock on wood). But, I thoroughly enjoy the flavors and I Iove the way that zinfandel ferments; it’s a much warmer fermentation. In the end, in a cellar of wine if I have to pull out one to have with dinner, I’d probably pull out zinfandel more than anything else. In general, even if I wasn’t a winemaker, I’d still pull out zinfandel. RS: I’m going to produce a movie about your adventures in winemaking at Mutt Lynch Winery, what should the title be? BRENDA: “Dreaming of a Leash-Free World.” That would be the title because there are so many restrictions and there shouldn’t be. You know this poor woman today at the tasting said, “You know I really like my wine over ice cubes.” I said, “Great, then drink it however you want. I could really care less, just drink more wine.” No matter how people want to drink it; out of a dixi cup, a mason jar, with or without ice cubes, blended. However it makes them happy is how they should drink it. You know, there’s not one liquor producer that says spirits shouldn’t be blended or mixed. There are people making huge money in careers as mixloights, but in the wine industry we tend to go oh no, no, no you can’t blend or mix wine. I say you should drink it however you like it, just drink more of it. RS: Can you share how you get involved with the different organizations you donate to? BRENDA: What we figured out from the beginning of time is that we actually make more money for the charities if we don’t just write them a check. If we actually show up for events, like today, and donate wine or have dinners, the charity makes more. I have to sell wine to actually make money to be able to give the charities, so we look at how we can work this out together. Today, I sold a lot of wine for the event and then made a donation for every bottle sold. We tend to shy away from charities that just want a check unless it’s an emergency situation. When Hurricane Sandy happened, we collected blankets and food and then paid to put it all on a truck and ship it out to the rescue groups. We do as much as we can, but we’ve learned that if I donate a case of wine and put it in either a silent auction or live auction, it will earn far more for the organization verses if I were to sell the wine and take a percentage of the price for a donation, which is $1. So, do you want to make $12 off a case sold or would you rather make $1000 in an auction. You know people always want to know how many dollars we donate and I tell them we actually donate a whole lot more wine to make money for the shelters verses writing a check. RS: Mutt Lynch Wine Club offers a unique twist, can you tell us about it? BRENDA: Our wine club is for you and your dogs. We have two different clubs; The Big Dog Club and The Little Dog Club. You can specialize your club too if you have multiple dogs. But in general, in the Little Dogs Club a half a case of wine would have five bottles of wine and a really cool dog toy/treat for your dog. Now if you have multiple dogs and want multiple toys we can create that. In the Big Dogs Club is 11 bottles of wine and a cool toy. It works out for everyone. As for our dog toys, sometimes they are with the times because it’s funny and cute. When the new iPhones came out there was a producer in Los Angeles that had and a squeaky toy that was called an iPup that looked like an iPhone. Another time we had a toy that was based on the Christoff Champagne and it was called the Chris paw. A popular one was the Michael Vick Chew toy. We had to call them the In-Vick, but we got a lot of fun pictures being sent in after their dogs chewed the heads off. We try to find unique toys for the club. We want all your family members to enjoy the club. To learn more about Brenda Lynch and Mutt Lynch Winery visit their website, like them on Facebook, or follow them on Twitter. Then join us on WineTable, follow me and together we’ll continue to discover the wonderful stories of the women sharing their passion for wine and spirits.